It's odd to have the weather spike into the 50s today as our house is covered with garland, stockings, and a pine needles. Because of our move some of the Christmas decorations are buried away but I'm happy to just have a few classics around. I think my excitement is contagious because Dylan is loving all the holiday goodies. We checked out a few Christmas books from the library, are talking about what to write in Santa's letter, and have started his advent calendar. 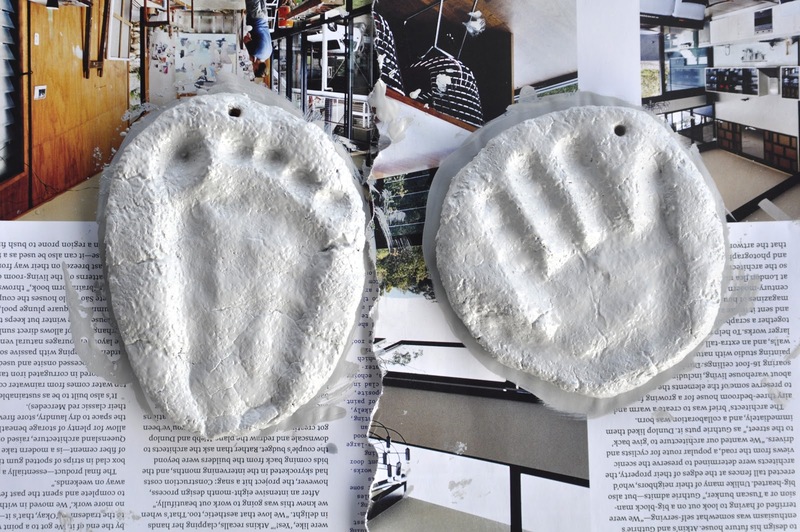 As a fun project (which doubles as a sweet keepsake) we made some super simple salt dough hand and footprint ornaments last week. Who doesn't like squishing their little fingers and toes into gooey dough? And because the whole family has been suffering from a general lack of sleep due to new found night frights I wanted to toast with a special drink, this Grapefruit-Ginger Juice with Pomegranate Ice, under the tree. To sleep! Winter's lack of fresh produce is sometimes depressing but citrus is delicious this time of year. I wanted something raw, tart, and soothing. This is full of goodness and would be especially festive topped with prosecco in place of seltzer. 1. Sprinkle pomegranate seeds in an empty ice cube tray and carefully fill with water. Place in freezer to freeze. 2. In a small saucepan, heat water, honey, and ginger root to a simmer. Let simmer for 5 minutes. Place in the freezer to cool. 3. Meanwhile, strain grapefruit and lime juices into a large pitcher to remove pulp and seeds. Mix. Strain in honey-ginger water, removing the ginger slices, and mix again. 4. 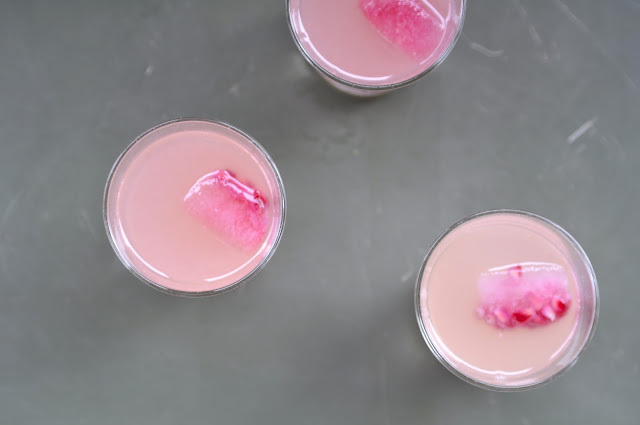 Place an ice cube in each glass, pour over juice and top with a splash of seltzer (or Prosecco!). 1. Pre-heat oven to 300 F. Mix flour and salt together. Pour in water and combine. 2. Knead to form a soft dough and to allow salt to break down. 3. Form into two balls and roll out then print. Poke small holes in the top to loop with string. 4. Bake at 300, on a parchment lined baking sheet, for 2 hours. Let cool then paint with your favorite color. It's 70 degrees here today! Crazy. This drink would be perfect! So beautiful! We have an early Christmas lunch coming up and I will try this out for it. As always your photos are divine. Thanks again!